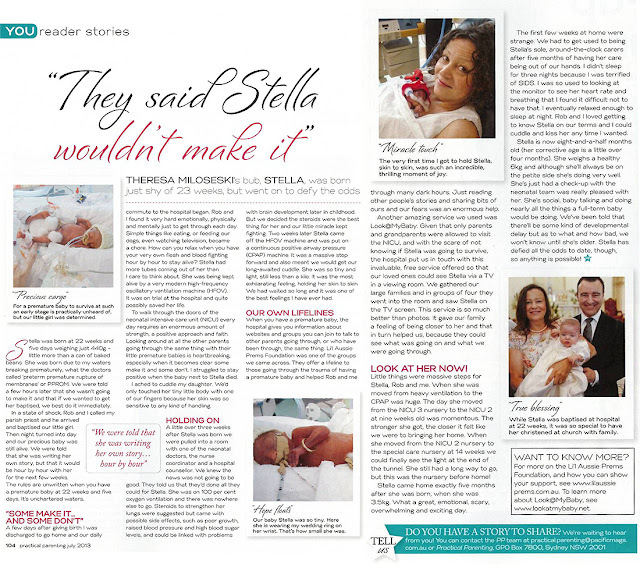 In September 2012 we received a lovely Blog story from a family using Look@MyBaby at the King Edward Memorial Hospital in Perth, WA. Their story has now been reported in the July edition of Practical Parenting! "They said Stella wouldn't make it". Stella - one the day after she was born with Mum's ring around her arm . You can read Stella's original story here, "Stella, King Edward Memorial Hospital NICU". A big thank you to Practical Parenting Magazine. As always, Debbie and the team at King Edward Memorial Hospital do an amazing job and we are proud to be part of the support and services in place at the hospital for NICU and special care families.